If you want to buy a Marian High School yearbook or sell your Marian High yearbook, this is the place to do it. Just make a post below to find another person who went to school in Bloomfield Hills to make the trade. 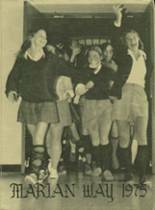 While you are reminiscing about the times you spent in high school at Marian High School, you should also check out alumni photos, yearbook listings and share any reunion info if possible.